We have tie-ups with top rental suppliers such as Easirent, Ace, London Car Rentals, and National and offer exclusive Cardiff Airport car rental deals. Our suppliers present us with exclusive collection of rental cars from all segments. With us, you can enjoy number of rental inclusions such as CDW, road fund tax, airport fee, third party insurance and much more. 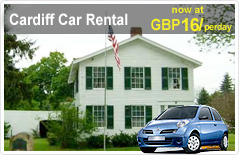 Rent a car at Cardiff Airport and explore city's rich history and Welsh culture.